The Lidget Compton Pent boasts design features not found in our rivals buildings including substantial galvanised C section supports, vented and steel roof. The Lidget Compton Pent Spar Flat roof design offers exceptionally value for money coupled with the markets most secure roofing design. 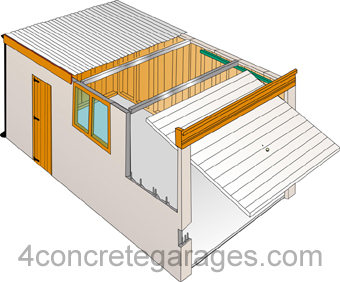 An ideal building to be sited on a council garage plot as a battery of block of garages or simply for some extra storage space beside your home. The roof is shiny galvanised and corrugated steel which is pitted for strength and applied with a condensation controlling paint to the underside. The roof supports are impressive steel C section and the roof is vented front and rear. This building is offered in spar/pebbledash, brick and stone effect, textured and Garaclad finishes or spar with a choice of brick front posts. Like all Lidget Compton buildings, maintenance-free PVC fascias, window and guttering maybe added, pedestrian doors or additional security measures such as extra-point locking. Most buildings are installed the very same day and come with a 10yr. construction and materials guarantee.